Renoir painting are examined with a microscope and it is clear, that Renoir used white and scarlet colors when he applied undercoating. 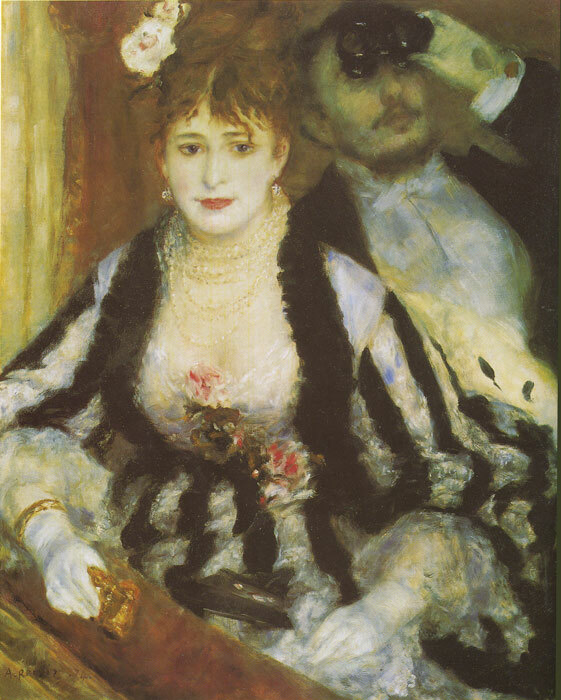 After that process, Renoir used transparent red and blue colors in an apparent bid to promote color imaging. In contemporary makeup methods, people often use blue and red powder over foundation cream , just like Renoir did to make the skin look transparent and beautiful. SPECIAL NOTE : The painter will make the reproduction as close to the original oil painting as possible. If you want your painting to alter from this likeness, please email us and " La Loge, 1874 " will be reproduced according to your special requirements.